Lace is one of my absolute favourite things about lingerie - I’m absolutely obsessed with it. Its transparent delicacy and floral intricacy are incomparable when it comes to lingerie fabrics – so it’s no surprise how heavily it’s used! However, as far as materials go, lace is pretty expensive, for a variety of reasons. 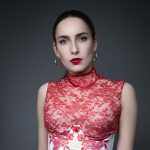 In this article I’m going to give you a brief introduction to this wonderful fabric and hopefully give you a better understanding of its significance in lingerie! 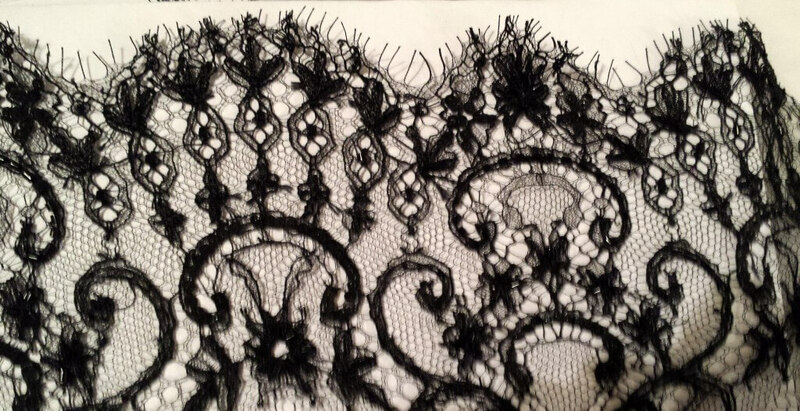 Lace was once created arduously by hand by skilled craftsmen. It held a hugely valuable place in society, with its various trends evoking a person's status in society. Lace has always been a luxury fabric - whilst its individual fibres aren't necessarily expensive in their raw state, it's the huge amount of work that goes into creating them that carries this cost. Handmade laces first began to appear in Italy around the late 15th century, and for many centuries thereafter, laces were made entirely by hand. The two basic types of handmade laces are either needle lace, where the pattern is created with a needle and thread, or bobbin lace, where threads are wound onto weighted bobbins and twisted and plaited. However, these beautiful laces were rarely used on undergarments, instead being flaunted on outer clothing as a demonstration of wealth (that is, when it wasn't outlawed for all but the clergy and aristocracy to wear!). It wasn't until the early 19th century that the most significant developments were made into machine-made laces. Amongst these was the 'Leavers' lace machine in 1813 - a machine that is still in use today, and was arguably one of the most instrumental in creating the modern lace industry. Please note that I've simplified the types of laces and machines greatly. There are many that I have chosen not to mention, and have instead chosen to cover the ones you will encounter most in lingerie. Raschel lace - most contemporary laces are created on this machine, which uses a Jacquard apparatus to create the lace pattern, knitting whole rows of loops of thread at a time. This is the type of lace you'll find most commonly in lingerie at lower price points. It is the fastest and easiest type of lace to manufacture, and one of the best for the use of synthetic fibres such as nylon. Ayten Gasson's 'Orla' bralet uses an English Leavers lace trim. Image from Ayten Gasson. Fleur of England's 'Pandora' babydoll uses French chantilly leavers lace. Image from Fleur of England. Leavers lace – although an antique machine, some of the finest laces found in modern lingerie are still made of this type of lace. Originally the Leavers lace industry was largely based in England (particularly Nottingham), but unfortunately there now remains only one manufacturer (who, conincidentally, makes many of the trims that Ayten Gasson uses in her designs). Most Leavers laces are now made in France, particularly in the region of Calais (in fact, many designers choose to refer to this type of lace as 'Dentelle de Calais'). These laces are incredibly fine, often with complex patterns. 'Chantilly' lace, where the pattern is interrupted throughout the design and surrounded by tulle, is a type of Leavers lace that requires threads to later be hand 'clipped' around the start and finish of each new lace design. You are most likely to find this type of lace used in high-end and luxury lingerie. Freya's 'Arabella' style uses an embroidery in the top cup and knicker. Image from Freya. Last season Bordelle created a custom 'thorn' embroidery for their lingerie designs. Image from Baby Likes To Pony. Schiffli embroidery - whilst this is not technically a lace, it is often mistaken for one. Machine embroideries are most commonly created using Schiffli machines, which lockstitches designs onto a tulle base. These designs can be extremely complex and beautiful. You'll find embroideries at all ends of the lingerie market. Brands like Freya and Fauve use a great deal of embroidery in their designs, and more high-end brands, like Agent Provocateur, use them as well. Luxury brands are also likely to have exclusive embroideries created just for them, such as Bordelle's thorn embroidery from last season. Myla's 'Layla' bra uses a guipure lace on the cups and cradle. Image from Journelle. Guipure lace - as with embroideries, Guipure is not technically a lace. It is, in fact, a heavy embroidery, where the tulle base has been chemically dissolved, leaving a free-standing embroidered design. It is a fairly expensive fabric to use as its creation can be quite time consuming and resource heavy. Myla often use Guipure embroideries in their lingerie. Embellished laces - often laces can be later worked into either by machine or by hand - some of the most popular techniques are cording (where thin pieces of cord are delicately stitched over the original lace design to add texture), embroidery (both hand and machine, where the lace design is gone over with stitching for emphasis) and beading (where beads and sequins are hand-stitched for further embellishment). These can all be fairly costly varieties of lace, as they require very specialised and time consuming skills to create. 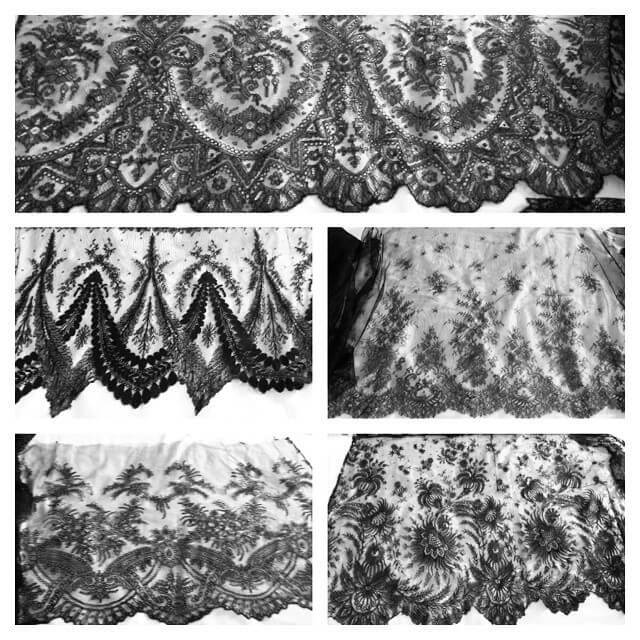 All-over – this type of lace is usually very wide and often does not necessarily have a finished edge – it is usually used the same as any other fabric and can be used to cover large areas in lace (for example, as the main fabric of a babydoll). Trims – these are usually thin laces that are used either as edge finishings or embellishments on lingerie. Flounce – this type of lace has no set width but features two different styles of edge on either side – usually one side features a scallop, whilst the other is flat. This lace is usually manufactured in matching symmetrical pairs. These laces (alongside galloons) are most commonly used in lingerie that features a scalloped edge. Galloon – this type of lace features the same scallop design on both sides of the lace, meaning that symmetrical pieces can be cut from the same piece of lace. Although it may not be something you'd ever considered, how lace is used can have a major influence on the cost of a garment. If a designer wants to use a scalloped edge along a bra cradle and wing, for example, they must pattern cut the bra to match up along each seam. This means each fabric piece for the bra has to be cut with a little overlap, so that when they are sewn together it appears as though the design continues through the bra, even when interrupted by stitching. Agent Provocateur Soiree's 'Adara' bra uses the lace's scallop throughout - on the cup, cradle and wing. This would incur quite a lot of waste but its price reflects this - £395 just for the bra. Image from Agent Provocateur. This type of pattern cutting has rather serious implications for garment cost, as it incurs an awful lot of waste. There are often large gaps between the cutting of each piece, regardless of how skilled the pattern cutter is. Although the odd centimeter of lace being wasted may not seem that serious a cost problem, you have to consider scaling up in larger areas of industry. If each lace bra wastes 5cm of lace and 1000s of bras are being sewn in one go, this can amount to whole kilometers of waste. Alternatively, if a particularly expensive type of lace is being used, those 5cm can get very pricey. For example, a particular lace trim I use in my designs is intricately beaded and costs around £35 a metre at wholesale price. That 5cm of wastage ends up costing around £1.50 per garment. Imagine scaling that up for production! Many brands work around these extra costs by topping an all-over lace fabric with a similar lace trim. The aesthetic is similar but usually costs a lot less! 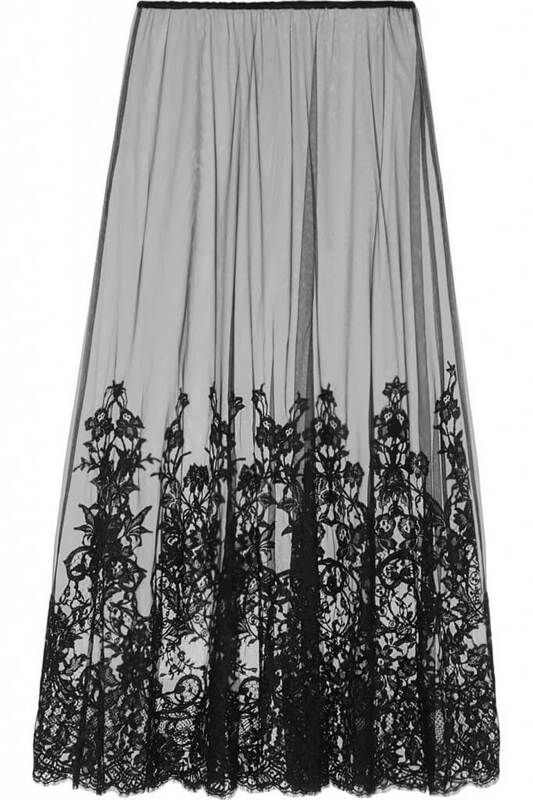 This tulle maxi skirt form Rosamosario uses lace appliqué along the entire hem. Image from Net-A-Porter. I covered the ins-and-outs of appliqué in a previous post, but this remains in my opinion one of the costlier ways to use lace in lingerie - not because there's particularly vast amounts of the fabric being used, but purely because of the sheer volume of labour involved in stitching. Appliqué either involves ready-made lace motifs (often guipure) or hand cutting designs from a chantilly lace and then stitching the edges onto the lingerie's fabric to create an isolated piece of embellishment. Brands at lower-price points tend to use ready-made lace motifs and tack just a couple of stitches on the most prominent parts of the motif. Usually though, the piece of lace is carefully machined with a zig-zag stitch along its intricate edge to attach it completely to the garment's fabric. This technique is most commonly seen in couture lingerie such as Carine Gilson and Rosamosario, where you're unlikely to find lingerie selling for less than £500. 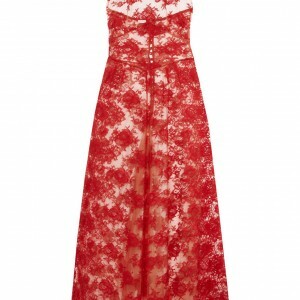 Readers: are you as fond of lace as I am? What is your favourite way that it's used in lingerie? This information is really fantastic. keep it up. I was watching a tv show about antiques when a feature about lace came up. Appearently, when the use of machine made lace became popular it was concidered horrible among the upper classes. It then became fashion to have as yellow lace as possible, to show how old and nicely hans made it was. Therefore when Nobel women got a new piece of lace they dyed it with eg tea to make it look old.